The federal government shutdown has ended and a clearer picture is emerging about how exactly it affected drivers and transit users. WASHINGTON – The federal government shutdown has ended and a clearer picture is emerging about how exactly it affected drivers and transit users. In general, the impact was felt more in Virginia than in Maryland, with a large concentration of defense workers and defense contractors living in the commonwealth. Metro reported a 20 percent drop in its ridership since the beginning of the month, and Metro General Manager Richard Sarles told reporters last week that the agency was losing a few hundred thousand dollars in revenue each day. While Sarles wouldn’t give a precise figure, sources say it was about $300,000 to $500,000 per day. Spokesman Dan Stessel cautioned against multiplying that number against the shutdown total to estimate the lost revenue, but Sarles did admit last Thursday that the agency had then lost a few million dollars in revenue. Metro moved to only six-car trains during the shutdown to help. It remains unclear when Metro will restore rush-hour eight-car train service, although it’ll likely coincide with federal workers returning to work. About 40 percent of Metro rush-hour riders are federal workers, both essential and non-essential employees. The end of the shutdown couldn’t come at a better time for Virginia Railway Express (VRE). VRE saw a large drop in ridership. “Through the first 13 days of the federal government shutdown, VRE’s ridership has continually waned. During the first week of the shutdown, ridership was only off about 25 percent. That number inched up to around 29 percent during week two and heading into week three that number has crept up to nearly 30 percent,” says VRE spokesman Mark Roeber. The Maryland Transit Administration (MTA) reports the shutdown affected its commuter buses more than MARC trains. “It’s safe to say we estimate MARC trains have been running with between 75 to 90 percent of the regular passenger load and commuter bus was somewhere between 40 to 50 percent of average ridership,” says MTA spokesman Paul Shephard. The 10 to 25 percent drop in train ridership depends on the line. MARC’s Penn Line sees the highest ridership, whereas the Camden Line sees the lowest average monthly ridership. MTA currently runs 24 commuter routes, including one to the National Institutes of Health and the new Walter Reed at the Medical Center in Bethesda and another to Ft. Meade. All were impacted during the shutdown. For drivers, the shutdown ending means a return to the normal morning rush-hour traffic. In Maryland, drivers hadn’t seen much of a difference in their commutes. According to the State Highway Authority, traffic along Interstate 270 south of 370, the Capital Beltway in Montgomery County and Prince George’s County and Interstate 95 were all at the same levels this month as last month. “Looking at Tuesday through Thursday for three weeks before the shutdown as well as Oct. 1, 2, 3, 8, 9, 10 and also the 15th, in every single instance for all five ATR’s the average daily traffic was actually slightly higher after the shutdown at each location,” says SHA spokesman Dave Buck. ATRs are automatic traffic records, or in simpler terms, little sensors in the road to measure the amount of cars using a road in a given hour. Buck says the figures show at each location measured on interstates 270, 495 and 95, the difference in traffic was less than 0.01 percent in October than September. Such a figure would not be statistically significant and means the congestion impact on Maryland drivers was non-existent. 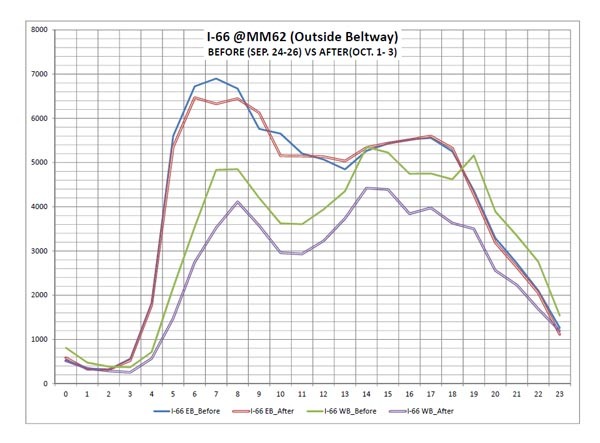 I-95 at Temple Hill (south of MD 5): Pre-shutdown daily average – 160,606. Post-shutdown daily average – 160,973. I-495 west of MD 650: Pre-shutdown daily average – 227,107. Post- shutdown daily average – 229,133. I-495 at Persimmon Tree Road: Pre-shutdown daily average – 211,778. Post-shutdown daily average – 213,652. In Virginia, congestion dropped much more than in Maryland, although still not nearly as large as the drop in transit usage. The Virginia Department of Transportation (VDOT) ran the numbers for different sections of Interstate 66 and Interstate 395/95 as a comparison. VDOT measured I-66 in both directions outside the Capital Beltway at Nutley Street and inside the Capital Beltway at Glebe Road. VDOT also measured I-395 near the 14th Street Bridge on both the main lanes and HOV lanes. The results show about a 10 percent drop in drivers at both locations during both the morning and afternoon rush. I-66 east at Nutley Street at 7 a.m.: Pre-shutdown hourly average – 6,900 cars. Post-shutdown hourly average – 6,300 hundred. I-66 west near Glebe Road at 3 p.m.: Pre-shutdown hourly average – 2,800 cars. Post-shutdown hourly average – 2,600 cars. I-395 north (main lanes) near the 14th Street Bridge at 8 a.m.: Pre-shutdown hourly average – 4,800 cars. Post-shutdown average – 4,600 cars. The exception was I-66 westbound at Nutley Street during both rush hours, where the drop was closer to 20 percent in the number of vehicles. For example, at 4 p.m., the average hourly average pre-shutdown was 4,800 cars, the average post-shutdown was 3,800 cars. So as the federal workforce returns back to the office, expect the delays along I-66 and I-395 to return back to the levels normally expected. Also expect crowded trains again on VRE, MARC and Metro.